Stay EPA purge and trap method compliant with the time tested, Centurion Purge and Trap Autosampler. Enjoy the benefits of increased sample throughput, instrument reliability, and optimized sample preps. 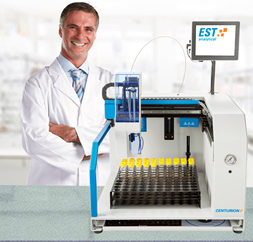 Maximize your productivity and profitability, while easily operating from any PC in your lab with the EST Analytical Centurion water/soil or water only autosampler. Lost vial errors are eliminated when processing water samples by eliminating the need to move the vial to a processing station. The needle enters the sample and gas is pushed into the vial, forcing sample out into a fixed loop made of inert Peek™ material. Sample processing and rinses are over 3 times faster than other systems. Various sample sized loops are available, but 5ml is standard. All needles and tubing are large diameter to handle particulate laden samples easily. Internal standard is added to the sample and the sample is then pushed over to the sparge vessel mounted on the purge and trap concentrator. Multiple samples can be extracted from a single sample vial. Sample integrity is maintained since the needle remains in the vial until sampling for both runs is complete. After processing, the sample needle is rinsed with hot water. When the concentrator is done purging, the sample is automatically drained, and the Centurion will rinse all lines and the purging vessel with hot water. This rinse can be repeated a programmable number of times. Due to improvements in column technology, EPA Methods such as 8260 can now be performed in about 10 minutes without sacrificing chromatographic resolution. The purge and trap cycle time has become the limiting factor to sample throughput. EST Analytical is the leading innovator in supplying several high throughput VOC solutions to environmental laboratories. The key to any of EST Analytical’s high throughput configurations is that NONE of the traditional parameters need to be altered from the recommended or stipulated parameters in EPA methodologies. Only the Centurion series Purge and Trap Autosampler offers a built-in option which allows the autosampler to connect and control two different purge and trap concentrators. When connected to a single GC/MS, you can improve your VOC throughput up to 80 to 100 runs per day! This is equivalent to two or more conventional systems at a fraction of the cost. All sequencing is controlled by the Centurion autosampler. GC and concentrator signals are tracked to ensure nothing gets out of sequence. Check on samples from any location! The Centurion series offers a unique interface that allows the user to easily perform diagnostics and set up sequences, as well as save and load methods. The Centurion, if placed on the company network, can be operated from any PC within the laboratory. Sequences can be created with just a couple of mouse clicks. The Centurion software also incorporates a RunLog that records samples run and any errors encountered. The log can be printed or saved for later review.